Many aerospace experts believe that the most cost-effective way to build a large orbital facility is to convert the External Tanks currently discarded on every Space Shuttle mission into habitable space. External Tanks Corporation, 80% owned by a consortium of universities and staffed and advised by a distinguished group of space statesmen and Washington hands, was first to do the extensive groundwork to bring this about. When I learned they were seeking funding, it seemed to me a natural opportunity for Autodesk. Here was a group trying to do with the very highest of high technology, manned space operations, precisely what Autodesk had done to CAD-reduce the cost by one or two orders of magnitude and thereby increase the market size by an even larger factor. In addition, the External Tank engineering project seemed a natural to apply Autodesk's engineering tools in environments outside the traditional, heavily funded, aerospace sector. When we made the investment in External Tanks in July of 1987, negotiations were underway with NASA. 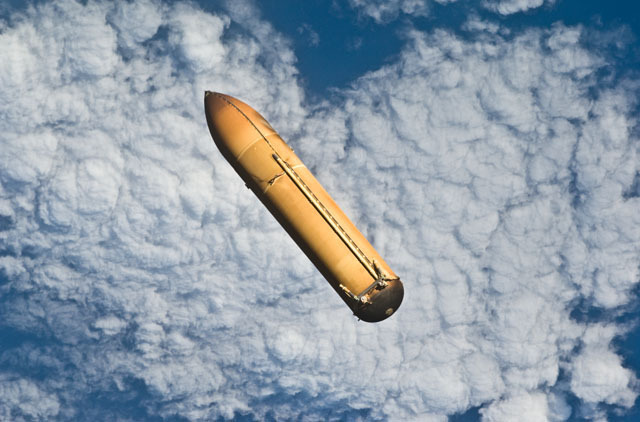 Since then, commercialisation of the External Tank has become part of the official U.S. national space policy, External Tanks has received an official NASA Memorandum of Understanding to develop the tanks, and NASA has undertaken preliminary work to study External Tanks Corporation's proposal to convert the tank into a Gamma Ray Imaging Telescope. This is the second draft of the press release, expressing our joint intent; the actual press release sent out was watered down somewhat to avoid offending certain parties. Sausalito, California, July 8, 1987. Autodesk, Inc. and External Tanks Corporation jointly announced today that Autodesk will purchase approximately 5% of the common stock of External Tanks Corporation for $225,000. External Tanks Corporation's aim is the development of an orbiting research and manufacturing facility called Labitat™, based on the External Tank (ET) which is launched as part of every Space Transportation System (Space Shuttle) mission and is currently discarded. External Tanks Corporation is 80% owned by the University Consortium for Atmospheric Research (UCAR), a group of 57 universities who have administered research programs and facilities for over 25 years. NASA is presently in the final stages of negotiating a Memorandum of Understanding with UCAR and External Tanks Corporation under which title for tanks lifted into orbit by STS missions will be transferred to UCAR and administered by External Tanks Corporation. External Tanks Corporation will transform these tanks into orbiting facilities which will then be leased to government, academic, and commercial customers at prices which are potentially one thousandth that of comparable orbiting facilities.